We commend your organizations’ efforts to treat people infected with HIV and to prevent mother-to-child HIV transmission. Such efforts should be continued and expanded. Unfortunately, that will not be enough to stop almost two million Africans from contracting HIV each year. This letter is spurred by results released in September 2012 from a national survey in Uganda in 2011. We call your attention to one of the findings: 16% of HIV infected children age 0-5 years had HIV-negative mothers, among children with tested mothers. This is the 4th national survey in Africa to match the HIV status of children and mothers. In the three previous surveys, Uganda in 2004-05, Swaziland in 2006-07, and Mozambique in 2009, 16%-31% of HIV-positive children had HIV-negative mothers (see survey reports at: http://www.measuredhs.com/countries/: see also analyses of raw data for Mozambique and Swaziland at: Int J STD AIDS 2009, 20:852-7; and http://www.webmedcentral.com/article_view/2206). To help stop HIV transmission through skin-piercing procedures in health care and cosmetic services, we urge your organizations to tell the African public what UNAIDS and WHO already tell UN, including World Bank, employees: “unsafe blood collection and transfusion practices and the use of contaminated syringes account for a notable share of new infections” (p. 9 in: http://whqlibdoc.who.int/unaids/2004/9291733717_eng.pdf), and “avoid having injections unless they are absolutely necessary… Avoid tattooing and ear piercing. Avoid any procedures that pierce the skin, such as acupuncture and dental work, unless they are genuinely necessary. Before submitting to any treatment that may give an entry point to HIV, ask whether the instruments to be used have been properly sterilized” (p. 23 in: http://whqlibdoc.who.int/hq/1991/WHO_GPA_DIR_91.9.pdf). Warning the public about blood-borne risks for HIV not only allows people to avoid risks, but also empowers and motivates the public to hold their health caretakers (both formal and informal), providers of cosmetic procedures, and ministries of health to a high standard of safety. Available evidence suggests that warning people about blood-borne risks could have a significant impact on HIV epidemics. During 2003-07, national surveys in 16 African countries asked people how to prevent HIV. In countries where more people said that avoiding contaminated instruments such as razor blades was a way to prevent HIV infection, people were less likely to be infected (see Figure). 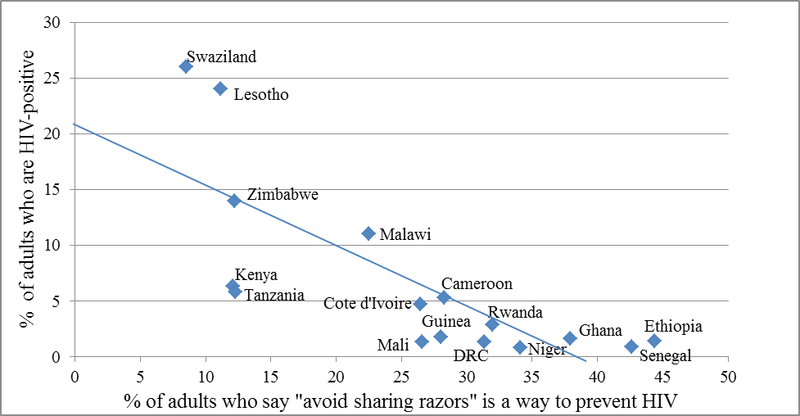 Source: For each country, the percent of adults who say “avoid sharing razors/blades” is the average of percents for men and women from 16 surveys, excluding adults who were not aware of HIV or had been previously tested for HIV, as reported in: J Infect Dev Ctries 2011; 5: 182-198, http://www.jidc.org/index.php/journal/article/view/21444987/518. Percents of adults with HIV (except for DRC and Ethiopia) are for 2009 from: UNAIDS, Report on the Global Epidemic 2010; for DRC and Ethiopia these are for 2007 and 2005, respectively, from national surveys available at: http://www.measuredhs.com/countries/. The World Medical Association’s Declaration of Lisbon on the Rights of the Patient (http://www.wma.net/en/30publications/10policies/l4/) avers that each patient has “the right to the information necessary to make his/her decisions.” We ask you to ensure that your organizations adhere to this principle by emphasizing blood-borne risks in HIV prevention education and by making safety a priority in all programming with health care and cosmetic service providers and institutions.